Is it ever too late to find your soulmate? 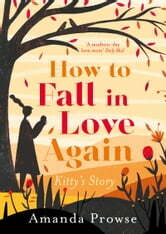 From Amanda Prowse, queen of heartbreak fiction, comes a gorgeous story of finding love when you've given up hope. Kitty Montrose isn't sure she believes in true love anymore. When she was a little girl, she had dreamed of finding her soulmate. Someone to laugh with, cry with, and to share her twilight years. But it never happened. She has her gorgeous children and grandchildren, but her marriage was never the happily-ever-after love story she'd imagined. Then Kitty bumps into Theo, an old flame. The timing was never right for them before. Could now be the time for Theo and Kitty to fall in love again? Such a beautifully written story of 3 people on life's journey, depicting all the twists and turns of the labyrinth of life and how, seizing all facets can guide your way.